Meet your group and guide on Decatur Street for a 30-minute orientation session and safety instruction. 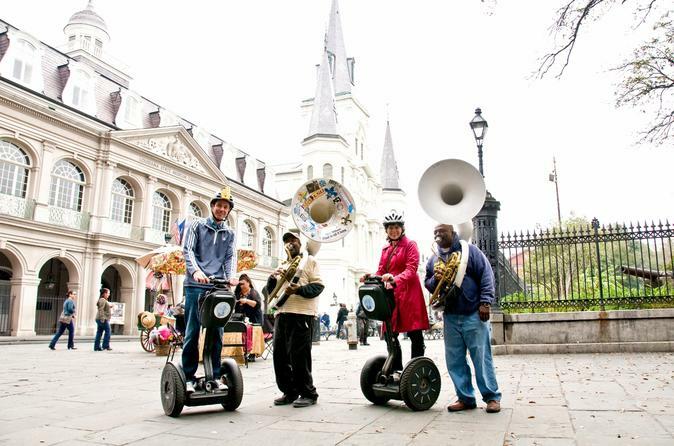 Once you feel comfortable on your Segway, it’s time to hit the road! Follow your guide through the French Quarter, New Orleans’ cultural hub and the oldest part of the city. Admire the French and Spanish colonial architecture and see buildings dating all the way back to the 1700s. Cruise along the Mississippi River waterfront and learn why the French chose to colonize New Orleans. Enjoy sweeping views of the West Bank and catch a glimpse of a steamship paddling by. Head to Louis Armstrong Park, the birthplace of jazz. Explore the beautifully manicured park, a lesser-known spot among tourists, and enjoy the green landscape dotted with fountains. Visit Jackson Square, the center of the city when the French first settled here. Surrounding the square are some of the oldest buildings in the US including St Louis Cathedral, the oldest operating Catholic Church in the US, and the Cabildo, where the Louisiana Purchase was signed in 1803. On bustling Bourbon Street, see the favorite hangout spot of the infamous French pirate Jean Lafitte. Then, stop by the Old US Mint, a historic landmark that now houses part of the Louisiana State Museum. Choose the 6pm evening departure for a New Orleans sunset treat. If you choose the 3-hour tour, you’ll also visit Tremé, made popular by the post-Hurricane Katrina HBO series. This neighborhood was home to Caucasians, Haitians, Creoles and ‘free people of color’ in the late 18th century, and helped give rise to jazz culture. You’ll also stop by Congo Square, a section of Armstrong Park that was once a vibrant market place where slaves and free people of color could trade, exchange news and play music on Sundays. Return to Decatur Street to conclude your tour.